Bake My Day! 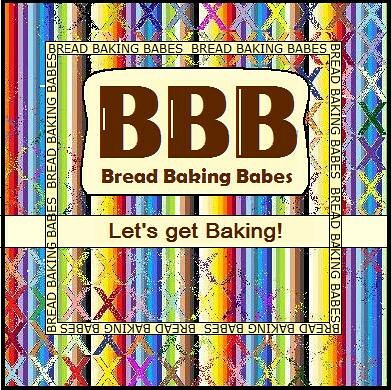 : We're Babes and we're Baking...Bizza! We're Babes and we're Baking...Bizza! I don't know where our fascination for very wet doughs comes from but we were at it again! (Girls and boys: help me do a anti-rain dance for next month! We want sun, we want dry, we want to wear flip-flops!). This one actually was an easy on. Yes, I said easy. Wet but easy. As a matter of fact it was something like, flop around in a bowl for a very long time and blub on a bakingsheet, pull it somewhere in the direction of the edges, top and bake. Now does that sound easy or what? Well, I knew my brains were in a fry this week but it took me until tonight that by adding sourdough and a one-night biga it wasn't exactly the easy way out!! Anyway... another month of the Bread Baking Babes, another challenge. I'll give you the recipe I followed here, for the Sullivan Street Pizza please go to our Kitchen of the Month: Tanna ! Allow 8-12 hrs to prepare the Biga Naturale - 18-20 minutes to knead - 2.1/2 to 3 hrs to ferment - 20-30 minutes to bake. 28 gr (1 oz) Liquid Starter - refreshed 2 hours prior to baking, you can use your/our starter! Mixing the biga: No need for a mixer, this can be done by hand: In a medium bowl add the water to the sourdough and stir with a spoon. Stir in the flour until a dough forms. Turn the dough out onto an unfloured countertop and knead just to blend all the ingredients, 1 to 2 minutes. You'll still see knobs and lumps, that's fine. Place the dough back in the bowl and cover. Let stand at room temperature (70 to 75 degrees) for 8 to 12 hours. 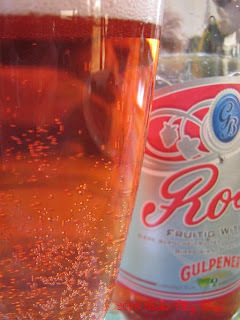 When ready, it will have doubled in size, definitely bubbly and you'll notice a fresh, tangy scent. DOUGH: Uncover the biga naturale and pour the water over it. Stir with a rubber spatula to soften the biga and break it up. Blend in the flour, yeast, and salt just until a very wet dough forms. KNEAD: using the dough hook, mix the dough on medium-high speed for 10 minutes. The dough will not clear the sides of the bowl and will climb up the dough hook. Periodically stop the machine and scrape down the hook and the sides of the bowl with a rubber spatula. Increase the speed to high (10 on a KitchenAid mixer) for 8 to 10 minutes more. 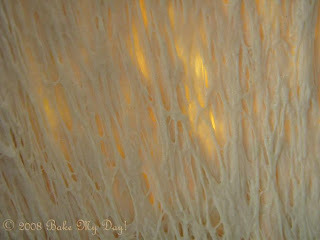 The dough will begin to pull away from the sides of the bowl, first in stringy strands, then in longer, thicker strands. Leader advices here to do the windowpane test to judge its readiness. I didn't. Judging my dough and seeing it pull away from the sides, listening to the sound I deemed it ready. 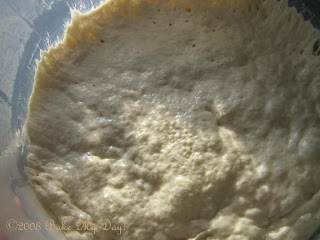 FERMENT: Transfer the dough to a lightly oiled, clear container with a lid and let it double in volume (1 1/2 hours). Leaving it in the container and gently deflate it by pushing it down in the center and pulling it up on the sides. Cover it again and continue to let it ferment until it doubles again, another 1.1/2 hrs. It will look absolutely alive and bubbly. OVEN: Preheat the oven to 500 degrees. 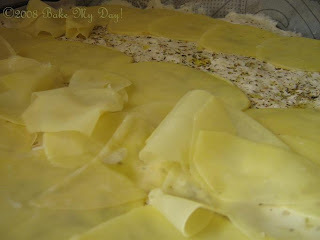 SHAPE AND TOPPINGS: Oil the baking sheet with olive oil or cover it with parchment paper. Uncover the dough and scrape it into the pan. With oiled hands, press and gently stretch the dough without tearing it to fill the baking sheet. It will be about 1/2-inch thick. If it recoils from the edges of the sheet, let it rest for 10 minutes, uncovered, and try again. Spread a light coat of olive oil over the dough with the pastry brush. Layer the potato slices, overlapping them slightly, over the dough. Sprinkle the onions, rosemary, and salt and a modest sprinkling of pepper evenly all over the pizza. BAKE: Place the baking sheet on the oven rack. 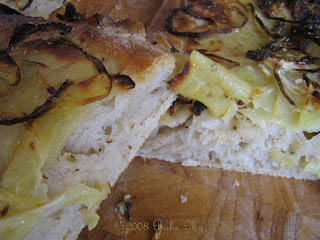 Bake the pizza until the potatoes and onions are tinged brown and the crust is golden, 20 to 30 minutes. COOL AND STORE THE PIZZA. Remove the baking sheet from the oven to a wire rack. Cool the pizza briefly before cutting it into generous rectangles. It is delicious hot or cold. Store leftover pizza in a resealable plastic bag at room temperature for 1 to 2 days. Sara, Gorel, Monique, Lien, Katie, Sher and Tanna tops the pizza with 3 posts! Pass that beer around would you please!! That must just be perfect for washing down a bizza!! 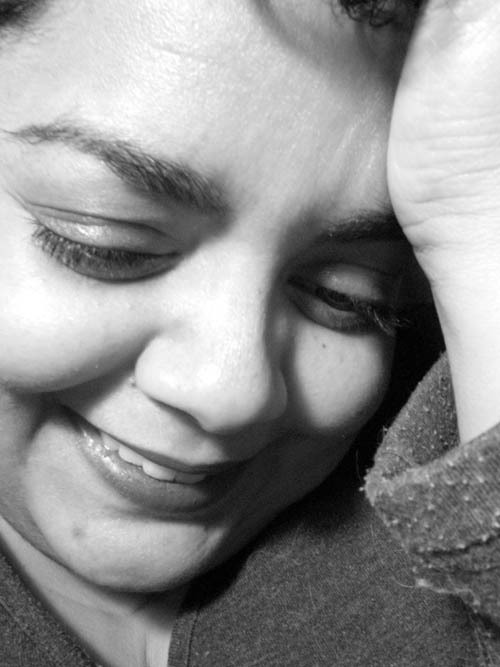 You are truly an unruly BBB but what a Babe!! The garlic is excellent, just slip it under the potatoes so it doesn't toast to bitter. That pizza looks fantastic! What a delicious challenge. Looks great, garlic gives a nice touch. I played with the wet dough and it was fun! This one looks good too I must say. Good job girl! I think I'll make this one too, but with some garlic and a little cheese on top... yummy! Pizza or foccacia, I don't care it's got potatoes on it!!! Oh, I think I've died and gone to heaven! Pizza and potatoes? I am so there! That had to be goooood! I want some of that beer, too! Those gorgious gluten curtains (great pic) ....the best.Now I know what curtains I need for my windows.Can I order ? I'm thinking with a glass of that beer in my hand I would have stuck around for quite a few slices! I'm thinking I may even try it again with potatoes on top. I need to try this one--maybe in the autumn. Wow! That looks absolutely fantastic! Are you sure about the small amount of the sourdough? I,ve made the biga last evening with al very lively sourdoughbatter and left it in a cool place. At this moment it doesn't look very active any more. Yes, the amount was enough it only needen more time. I left it in the shed and ignored it till the next day. Well, it was lively then! The dough was wonderfull; just like bubblegum. Next time I need two bakingtrays and a few guests more to eat all this.